When we were young, we met up a lot with our other relatives at my grandparents’ place. My parents moved out after they got married but always made it a point to go back and visit whenever we could. It was the same with our uncles and aunts who had moved out. Gatherings were a noisy, but also joyous affair, playing with cousins and also neighbours’ children whom we all grew up with. Apart from the regular weekend visits, what was particularly worth looking forward to were the “important days”. Usually it was the numerous marked Chinese-related festivals and celebrations, from Chinese New Year, and Chap Goh Meh at the beginning of the lunar calendar year, through Cheng Beng and dumpling festival right up to “bulan tujoh“, mooncake festival and finally Tang Chek. Apart from my own grandparents’ birthday celebrations, there were the birthdays of deities and of course the “ari see kee”, i.e. death anniversaries of our ancestors. Most of these “ari besair” were marked with an elaborated prayer session in the late morning or early afternoon and of course a pig out session that followed, enjoying the laok semayang that were prepared to honour the gods or ancestors first before being devoured by us. 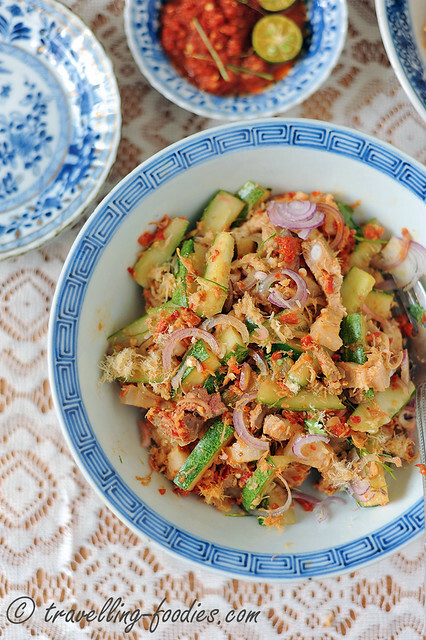 Many of the dishes were eaten as it is, but some were “transformed” into other delectables, and sambal timun was one of them. Ask for recommendations to local delights from Singapore and surely a couple of familiar names would pop up! Chilli Crab, Katong Laksa, Rojak, Bak Kut Teh and of course Hainanese Chicken Rice comes immediately to mind! 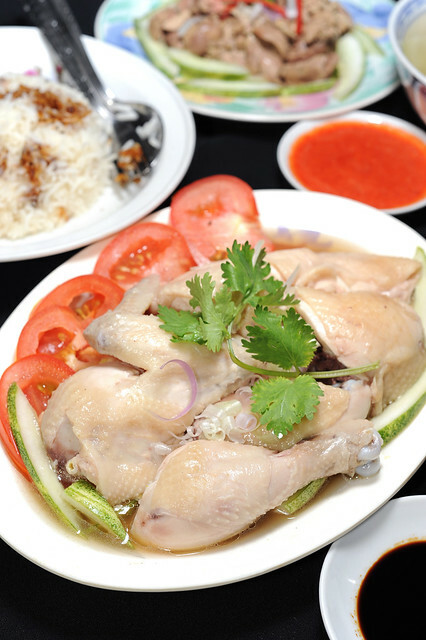 Despite its name, Hainanese Chicken Rice actually has its roots in Singapore. Well, others may fervently swear by Malaysia as the point of origin but we ain’t gonna bicker about that because it would be utterly pointless and no one really cares! And could someone please drill that notion into Ng Yen Yen? Anyway, one thing we know for sure is, Hainanese Chicken Rice did not come from Hainan Island! Well, there is a version there callede 文昌鸡 Wen Chang Chicken, which bears a remote resemblance to what we are accustomed to seeing and eating over here. This is just one of the very many food-naming idiosyncrasies, much like how 星洲炒米粉 Singapore-styled Fried Bee Hoon (rice vermicelli), a very popular 大排档 roadside hawker dish in Hong Kong, characterised by the liberal use of curry powder, is quite virtually non-existential here in the city state!